It is human’s nature that a person considers his work best what he does himself and sometimes it proves quite right. Every WordPress user wants his site to out-stand from the rest in terms of its looks and everybody like it. This post is about WordPress themes related to environment, nature, going green, eco-friendly, conservation, preservation, sustainable, organic, ecological and environmental sites. In this post we’ve collected some of the amazing free nature WordPress themes 2015 that best show the value behind organic farming. The designer of these WordPress free themes claim that these are Responsive, SEO Optimized, Elegant, and User friendly and they are very dynamic in terms of their use. You have a treasure of natural and wholesome produce, so it is time to show it to the world in the best way possible. BlueOcean is an amazing free WordPress theme, great solution for blog about traveling. The theme comes with easy-to-use administrative panel and lots of configurations provide a great base to build on. With a mellow color scheme and non-central elements on the page that fade into the mist when they’re not the main focal point, Misty Lake provides a tranquil space for your readers to relax and enjoy your words and photos. Bouquet is a simple, elegant theme infused with floral essences. Shroud your content in a canopy of subtle shadows, soft rounded corners, and sweet fragrances. 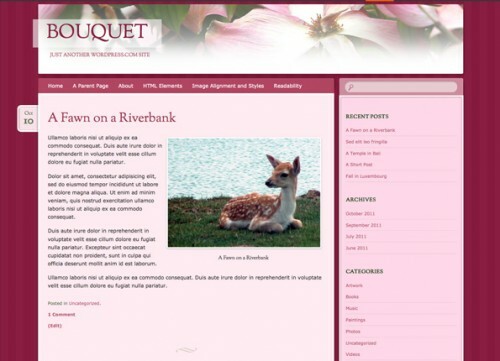 Bouquet offers a responsive layout structure that adapts to fit a variety of screen sizes. 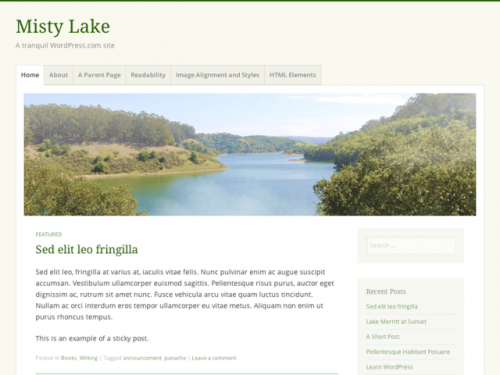 Savanna is simple, but powerful WordPress theme for nature blog. The theme comes with easy-to-use administrative panel and lots of configurations provide a great base to build on. 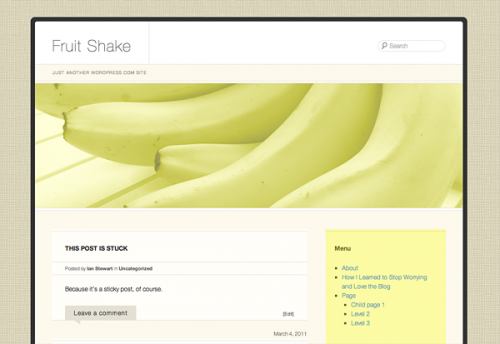 Fruit Shake is an updated, more fruitylicious, successor to the quirky Banana Smoothie theme. Its packed with delicious and fun features and might be just perfect for your blog – even if you’re not obsessed with fruit. This fun, colorful theme is flexible enough to fit any type of site it’s simply loaded with options. It offers layout choices of one, two, or three columns, six color schemes, four footer widget areas, and support for six post formats. 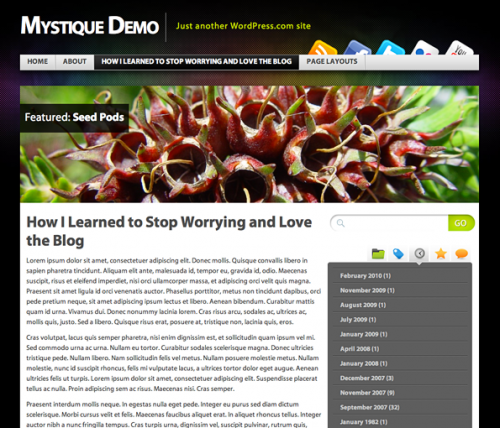 Safari is an amazing free WordPress theme, great solution for blog about nature. The theme comes with easy-to-use administrative panel and lots of configurations provide a great base to build on. Sunspot is a great all-purpose blogging canvas, especially for those who prefer a dark color scheme. It also features a layout that adapts gracefully to fit smaller screens, ensuring that your readers can enjoy your content on a variety of devices. 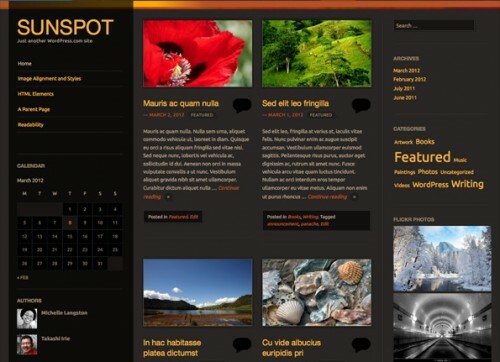 Areal is an amazing free WordPress theme, great solution for blog about nature. The theme comes with easy-to-use administrative panel and lots of configurations provide a great base to build on.